Occasionally, people will ask me why I’m here. They don’t mean I should leave– only what it is that keeps me here. It’s good to think about why you live in the place you do. You can always say that work brought you here, or love, or you were raised here, or it’s all you know… but I can’t say any of these… so I start thinking about why Whitehorse is the perfect city. Whitehorse has some very unique qualities. In a nutshell: It functions as both the capital and largest city of our territory, while maintaining many characteristics of a small town. It has the cultural capital of a city 10 to 20 times its size, compressed in a small area, as it is home to a surprisingly large number of artsy folk–musicians, artists, writers and our ilk. Whitehorse is drenched in pivotal and interesting history. Finally it is surrounded by extensive wilderness that affords outdoor enthusiasts a vast playground, and keeps folks green-minded. 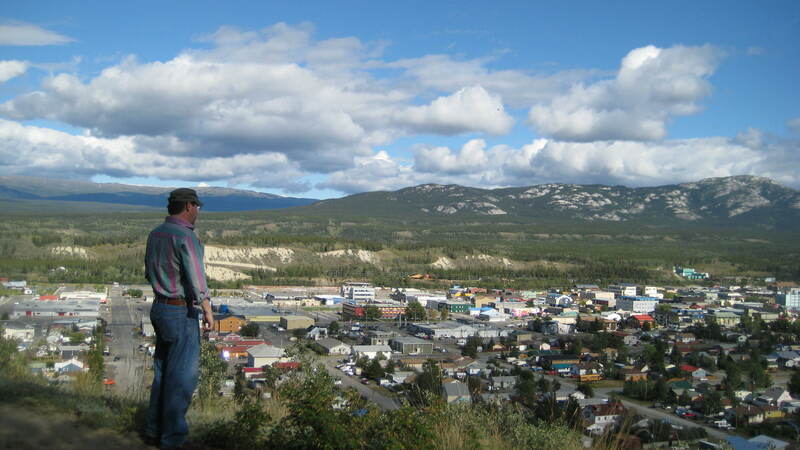 Whitehorse, for all its importance in the Yukon, is still the size of a small town: 23,000 people. You will know many, many people. It’s hard to be anonymous here. And people are friendly. Small towns also have quirky qualities on display— we have unique parades, events, colorful characters. People care about each other because they run into each other all the time, and because we all make the city run. All the best, and worst, of a small town can be found here. But I think the best of our qualities far outweighs our worst ones. Because Whitehorse is both the capital and the largest city, it attracts the most diverse, and the most numerous artists, musicians, writers, creative people. Since we all need contract work, you can find your artists in the city of contracts. And Whitehorse flourishes because of these creative folks. Every winter is a smorgasbord of things to do— five or six theatre companies, interchanging bands and musical acts (with multiple CD releases), art in your cafes and in your galleries, poetry/fiction readings, cookbook launches. And I just listed the LOCALS. Not to mention all the big name performers, etc, that come through our town through the Jazz Series, the Classical Series, the Yukon Arts Centre, etc. We have more going on than I ever had when I lived in cities of 300,000. You have to choose what you’ll go to every night–you can’t see everything. We find out what to do every week in What’s Up Yukon! This is because the big things don’t go to a town that’s larger than us…. and everything in the Yukon (except you, Old Crow) is within driving distance. We are not Plainview Texas where all the things that happen go to Lubbock… bypassing the small town. We also have creative business owners who start unique businesses. Mac’s Fireweed Bookstore, Riverside Grocery, The Yukon Brewing Company, Baked Cafe, the Kebabery, the Urban Cake Shop, Titan gaming, Frantic Follies, Sam N Andy’s, Arctica, Sanchez, Tokyo Sushi, Lil’s Diner, Midnight Sun Coffeeroasters, –and creative people who start societies and groups that bring enjoyment to everyone— bellydancing, acrylic painting, weaving, poetry festivals, film festivals, theatre festivals, bluegrass festivals, snow carving, sword fighting, … anything you could want, here, in Whitehorse. We are so thick with interesting history. The Gold Rush may be where Tourists start–but our history is rich from the Beringia–a land never covered in the last ice age–to the Kwanlin Dun people–to the Gold Rush, the WhitePass and Yukon Railway, the Alaska Highway, and our notorious pasts, our mystique, our legends, our isolation which breeds all the best stories. What isn’t covered at MacBride Museum, the Beringia Center, or the Yukon Transportation Museum, you can find at the Archives, a wealth of historical knowledge in one giant organized basement. Well said. The camerado and I are considering our geographic options and wish we could find a place as cool as your description of Whitehorse. Enticing. i love this post! my husband and i want to move up there soon – this blog made the journey seem essential. Whitehorse was just picked as the number one small city to live in Canada! WOo-Hoo! Could somebody answer me on what is the cost of living in Whitehorse? I mean housing, rent of 2 bedrooms? Really nice article, I’ve been fascinated by small remote places forever. I like the sound of yours! Of course I’m fairly partial to mine too — check out Key West Florida sometime. Thanks for the article.